In this tour, the architects from Bates Masi Architects present a New York home that conforms beautifully to the lifestyle of a modern family. It’s clear that family lifestyles are far different today than they were even 20 years ago, thanks to the invention of laptops, cell phones, and an array of personal devices that make it tempting to be multitasking all of the time. This home was built with this modern family dynamic in mind, with features that are conducive to a busy, multi-faceted group with a wide set of priorities that can shift at a moment’s notice. Through its layout and choice of materials, the home enjoys a feeling of transparency and communication, but the house has been carefully designed to also respect the unique functionality of each space. As you’ll see, the separation of the home into distinct volumes allows the inhabitants to pursue a wide range of activities simultaneously, with awareness – but not disturbance – of the others’ activities. In many ways, the thoughtful organization of the home’s layout brings a sense of order to the chaotic buzz of daily life. Abundant with elements celebrating sunlight, warmth, and radiance, the home's interiors are positively aglow with energy, bringing the element of fire to this crisp, contemporary space. From this initial view, the definition between distinct volumes of the home becomes very clear. The home’s structure comprises a series of open-ended boxes, each tailored to a specific function, from hosting social gatherings with guests to working quietly in the office. The transitional space between each volume is occupied by gardens and patios providing further separation, highlighting the transition from one home activity to another. The clear facade focuses your view on the central volume, an open mass allowing views all the way from the street into the backyard. Each volume of the home has audio, video, and climate systems independent of the others, permitting several different activities to take place simultaneously. Likewise, you can see how, rather than being dictated by convention, each volume’s dimensions are dictated by the events it intends to host, creating a scene full of movement and variance, resembling a collection of tiered golden boxes stacked side by side. The interior is defined by deep golden and bronze tones offered by the mahogany boards that wrap around the floors, ceilings, and walls. The varied tones in these boards create a striped pattern that visually pulls your gaze about the room, instilling in the space a sense of direction, energy, and radiance as golden and bronze lines stripes radiate across its surfaces. In combination with mahogany, the floors include sections of marbled travertine, both inside and on sections of the outdoor patio. If there were any element to correspond with this interior, it is the element of fire. With gold and bronze tones heating up the walls and thick stripes that appear to radiate as sunlight shines across the interior surfaces, this space conjures up imagery of warmth and wild radiance. To compliment this theme, a statement fireplace draws eyes as both a structural and artistic element of the room. This feature uses the repetition of overlapping polished bronze panels to create strong vertical lines in the room, with small gaps that highlight the sun as its light filters in through a window above. Not only is this piece positively glowing with warmth, but it also conceals structural elements, hiding a moment frame within its vertical volume that supports lateral loads to allow the room to remain as open as it is. A closer look at the dining room highlights the motion that these architects have captures in the walls, ceiling, and even the fluid lines of the chandelier suspended over the long dining room table. Across the room, you can peek into the kitchen, below. In a separate module, the kitchen enjoys more privacy than the areas intended for entertaining guests. A highly unusual backsplash enjoys light from a hidden window, bringing an unexpected lightness and distinction to the prep space. This bedroom is a celebration of stripes, with long parallel lines featured in just about everything. The headboard has been constructed of repeating strips of belting leather, in harmony with the motion-driven and purposeful stripe theme. In beautiful symmetry, this bathroom joins separate shower spaces with a centrally located bath, an arrangement that allows the simple oval tub to rest as the focal point of the room. With translucent panels dividing the room, this bathroom is a fine example of the way these architects have created communicative spaces that still maintain a sense of independence and distinction. Outside, a rich green lawn leads away from the home and down a small slope to a serene pool. Tall grasses and a short stone wall help to anchor the feature in its environment while contributing a sense of privacy. Like the interior, the exterior offers various spaces serving different functions. A patio close to the central unit is a sheltered spot for a casual picnic, while the sunny terrace beside the pool provides a relaxing space for lounging in the sunshine. Nearby, a poolside bar serves up a nice spot for entertaining guests into the evening. 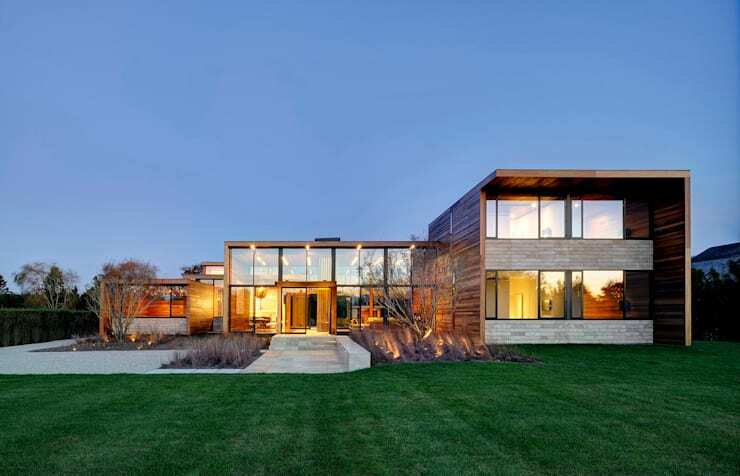 Share your thoughts on this stunning example of contemporary home architecture below!